How can I stop aggressive behavior? I rescued a two year old coton (Molly) from a shelter in October. She was aggressive with my one year old coton dachshund mix (Addi) at first but we corrected the behavior, for the most part. She still occasionally does a low growl but I notice it's mostly when she doesn't want Addi around for whatever reason. Lately she's been snapping at my six year old when he tries to love on her. We've gotten onto him for getting in her face and are trying to break him of that but he just wants to love her. We get onto her when she does it and she immediately seems sorry but I don't want her to do it at all. I'm worried she may be too old to break this behavior but don't know how to start if not. Suggestions? Comments for How can I stop aggressive behavior? Hi my cottons de Tulare is 4 months old puppy.Now a days she is getting more aggressive like biting chewing and showing her angerness behavior. We don't know why she is doing it,I feel now so frustrating. Don't know what to do. She is very happy and healthy and playfull dog. Aggressive and means to hurt! Our 6 month old, Gizmo (spayed female) chases our 8 year old English bulldog (Maisy) like prey. Maisy is terrorized by Gizmo and each time I correct Gizmo, she attacks me. She means me harm and has drawn blood a few times. I am consistent and when she's mad, she pres on the floor. We brought her home when she was 8 weeks and have been consistent. I am home with both of them all day and make sure that potty, play, exercise, grooming and feeding is consistent and scheduled. I'm very close to having to surrender her back to her breeder and it's breaking my heart. Our home is terrorized and we actually got her for Maisy at our vets suggestion. There is no medical reasons for this behavior and I am running out of options. My husband is not happy and Maisy is also withdrawing from wanting to spend time with us. I have no idea what to do from here. It is very frustrating to have a pet that is aggressive toward people especially those in the home...Sherry Cotton Candie's advice is very good..You just need to be patient and consistent in dealing with your pup. Since you rescued her, you don't know what she experienced in those two years.. I got Triscuit after she basically lived in a cage in a pet shop for 7 month. I will never know what happened to her, but I have had her for 3 years now, and she is the most loving little girl.. She would nip (ok bite) people when they came in, and I finally put treats in a treatbag outside the door handle and those who come in will throw her a treat when they enter...she will take it, and go off and enjoy it....Housetraining was a nightmare, but that was finally resolved as well. Just be vigilant with her around people, and as I said be patient and consistent...it is totally worth it. Would love to see a picture of her if it is possible, she sounds adorable...of course like any of our pups. Good luck and we are all here for any advice or comments you may have ...thanks to Gale and Luc. Thank you for rescuing Molly and hope maybe by now things have gotten a little better in your household. Not knowing Molly's history she may feel threatened by Addi and even your son. She will learn that Addi was there first and should be the boss of them and always give Addi food and treats first. I'm thinking they will get to be good buddies in time, I rescued one almost two yrs ago and went thru some really rough times at first. For your son's safety it really is important for him to keep his face away from Molly until they really develop a bond. At two if she has not been around children they can be intimidating. He is old enough to understand the new dog is scared and maybe he could feed treats and play fetch, roll around on the floor with her, just anything to build trust. Good luck and keep us posted as to how she does. Time will work wonders. Is this dominance or fear behavior? Hello, my name is Cesar. We recently got a coton from a friend. She's 8 months old and is a female. When she first got to our home she was hiding in a corner of the house - I guess she wasn't happy with the move. Now she moves around like nothing we've had her 5 days now. I'm having a problem with her we are a family of 5 all adults and every time she sees me she growls and then starts to bark at me. She only does this to me for some reason. Once I start petting her she'll be ok then she'll start growling at me again. She especially does this when she is with someone else like my mom or dad. Do you think this is dominant behavior or is she afraid of me? Comments for Is this dominance or fear behavior? My coton, Guinness, 15 weeks old, growls at me because he wants play. He wants my attention. He wants me to run after him. If I stop, he growls again. He would bite my slippers or pants to call my attention, then he would run. Not sure knowing what is going on when she growls at u & u pet her she could possibly b talking to u bcause u say she lets u pet her & continues to growl maybe like she likes it. Kinda of like when u rub their belly & some call it growling, some call it purring like a cat but they enjoy so they make a noise. She's pretty young to really b showing aggressive behavior but she could b testing the water. Whn mom or dad r holding her & she growls at anyone coming closing tell or no or use a voice with an AW AW & put her down on the floor. She will learn quickly this is not acceptable behaviour when u sit on my lap. When she growls at u pay attn if u have a hat on maybe coming home from work so she smells something unfamiliar or doesn't recognize u right off since she New. Maybe it shoes or boots make extra noise on the flooring so she scared of it. I might think there is something about you that she is fearful of. Our coton for example is very shy with men with beards and men in uniform. We have finally gotten her to approach our mailman and we and the mailman worked with her using the reward system. If she approached him without barking at him he would reward her with a small treat and a pat on the head. Now no treat is necessary and a pat is what he gives her. She will even stand on her back feet now and wave her front feet when she sees him approaching. It takes work but you can train cotons. They are very smart and want to please. Chloe might growl some when she is in her crate and if you approach her to get her out she lets you know that this is her spot and would rather get out on her own. Now we simply open the door and she comes out on her own terms. This behavior started only because our grandkids wanted her out to play with and they would try to remove her from the crate, she would have nothing to do with that. Try to approach her slowly, with the palm of your hands up as the previous writer mentioned, have a treat ready to reward her if she lets you get close at all without barking and growling at you. Don't put a time on it, as soon as she no longer is behaving badly towards you that's when you offer her the reward. I know you'll get this resolved you just need to take it slow and be consistent. We haven't had that problem with our Coton. She was not a pup when we got her but less than 2. She is shy of people and it takes a lot for her to walk up to someone she knows (like a neighbor) and let them pet her - but she doesn't bark. Our Havanese on the other hand, has a lot to say and insists that people pet her or she barks and waves her paws at them. Our Havanese is a dominant Alpha dog. She is always putting other dogs in their place and trys that with me and my husband. We do not let her get away with that. We raise our voice and say no and step into her space. She stops. Maybe your Coton is asserting herself with you to test your reaction. She may be telling you that you can pet her on her terms. Some dogs have been hit and they can be afraid if you raise your hand. We always hold our hands down with palm open. We have 2 male Cotons, Augie & Olaf. We got them from the same breeder but different litters. They are a week a part in age. We got 2 so they wouldn't be alone while we are at work. They have been with us since they were 8 weeks old. They are now 8 months old. They have always played together and are practically inseparable. However, over the past month Olaf has become very aggressive towards Augie. They still play, but Olaf will attack Augie. It started when we would bring them in from potty time in the back yard. They get a treat when we call them to come in. After each of them get there treat Olaf attacks. Also, if we pick Olaf up, if he sees Augie he will snarl, show his teeth and bark aggressively. If we put him down he will attack. After he calms down Augie always approaches him, almost like he is saying he is sorry....sometimes Olaf will accept and sometimes he will attack again. Nothing has changed in the their schedule, and we are at a loss for how to correct his behavior. 1) Walk the dogs together on leash. Start with them on either side and move them to side by side, with leashes in one hand. Do this every day for at least 45 minutes, making sure they are beside or slightly behind you at heel. 3) At feeding time, feed the calm dog first. Always. 4) Invite them to you for affection only when you are ready and do it carefully to preserve order. Don't give hugs and kisses automatically just because they come begging. If you invite one to your lap and it lashes out at the other, immediately put the aggressor out of your lap and send it further from you to lay down and wait. Do not tolerate aggressive behavior even for one second when it involves "claiming" you. You can then invite the submissive one for affection, making sure the aggressor continues to lay down and wait. Then you can invite the original aggressor in for his turn after he has shown the behavior you want. 5) Be patient and persistent. Your job is to keep order in the pack so everyone can live together calmly and happily. By rewarding only the behavior you want and being absolutely consistent about it, you will get it. Good luck and be sure to let us know how you're doing! Just to say it's pretty normal as your dog's grow up that they test the waters on who is more dominant. It's like teenagers in the house. The important thing is you are going to nip it in the bud. It will be like the parent saying I'm the grown up & these actions r not acceptable in positive reinforcement. The nice thing about Zak George is you can ask him questions that he will answer. He use to have a show on animal planet. Now animal planet has no training info. I have trained dogs for a long time. Our 10 yr old granddaughter got a puppy & as I was helping we also watched the videos since his enthusiasm by being young well it really helped her relate. You will do fine bc Cotons r so smart that if you r doing it wrong they go w/the flow & change direction w/u. Have fun w/training take lots of pics to share. Good advice from Vicky and Bruce. I do not have anything to add to their comments. Just wanted to say I hope you find a solution and both of your dogs are gorgeous!!! If you are on Facebook go to Zak George Facebook page where he posts free training videos on you tube. Their all listed on his page. He is a very good positive dog trainer. As our minds absorb u may want to watch them more then once b4 trying it bc each time we absorb more. I know this works for me so it's just a suggestion. Good luck. I think we may have one of their siblings. I don't have any suggested solution but we have consulted with our breeder on some other issues and she has been a great help. Best of luck! I'm sure it's stressful to see the aggression. MY Coton de Tuelar is a very good dog, he is smart, beautiful and just a joy to have around. But, I am having a few problems with him. When My 2 young children walk across the room he attacks their feet. I can not get him to stop this. Also when I take him outside is eats stones and digs in the yard and eat sticks. I am affaid he is going to damage himself. How do I get him to stop this bad behavoir? Hi Vickie, sounds like your Coton is exhibiting classic puppy behavior. Unfortunately unless you intervene and start teaching him the proper behavior, he'll just continue. Dogs are a lot like kids; you have to teach them how to behave and be safe. What kind of training have you done? He's at the perfect age to start obedience and behavior training. Almost all communities have a free or low cost group training program (here in the States at least) - check with your Vet. I also recommend Doggy Dan's Online Trainer. You can sign up for one week for just $1 right now and he's got training videos that will walk you through each step of the training process. I love these videos because they use a very gentle and loving form of training. Also, I know your kids are young, but it also helps to get them involved in the training. My coton is 5 months old. But we have never had problems with him eating sticks and rocks before. I am afraid he is going to damage himself. I can feel him before he goes outside, He will only go outside if I am with him. Now when I try to get sticks or stones away from him, he has turned it into a game of chase. My kids are now afraid to walk by him as he really has a strong bit on him and draws blood on there feet. I know he is just wanting to play but they do not understand, as much as you try to explain to the kids that the dog is only a baby still. I don't no what to do. How old is your Coton? Nipping is a very common behavior in puppies. It's how they play and try to get attention. It's important not to inadvertently give your dog lots of attention (good or bad) when he starts nipping at the kids. The best thing to do is to turn away from him and ignore him. As for the eating sticks and such.... does he do this every time, even after he's eaten? Can you substitute something else when he's outside like a favorite toy? Once again, if he's a puppy this is pretty "normal". My dog chewed just about everything when he was a puppy (wood, metal, furniture, clothes - you name it). Good chew toys and lots of patience usually do the trick. Also, the Leave It or Drop it commands come in really handy. My Coton does this all the time to me (not my husband), he is more a momma's boy. I think he is trying to lead me to where "he" wants me to go. Loves, loves to play ALL the time. Why is my Coton aggressive? After much research, I bought a Coton when she was 10 weeks old. She is now 10 months old. She is really smart and was started in training classes as soon as I got her. She excelled at every level. Coco aggressively barks at children, adults and other dogs and has been doing this since she was 5 months old. I had a dog behaviorist recently come to the house to witness this behavior and Coco tried to attack her. Her growling and barking was scary. I have another Coton that is a classic Coton. Very sweet. They get along beautifully. I take her to work with me everyday but this "attack mode" that she goes into when people enter my office is no longer safe. Has anyone ever heard of a Coton having this type of personality? I'm really baffled. Comments for Why is my Coton aggressive? Tuffy is an alpha male, now 5 years old.He is very protective. He has always growled and barked at people who come to visit only when they are leaving, he paws the back of your legs begging "don't go"!. I believe he wants to accumulate the largest pack of humans any dog has ever had. Tuffy does not want to be left behind. It' boils down to me his master, taking charge at all times. I put him on the short leash and keep him behind me if I am forewarned and have a chance to do this. I need to let him know, coming or going the visitors are under my control. Tuffy acts tough, but is generally a fearful dog, he jumps at any sudden noise. From what I read if a dog owner is not constantly showing the dog whose boss, the dog will take charge. I do not like the idea of everyone giving my dog treats as discipline, Especially strangers. It's because I grew up with dogs and my Dad trained them and warned us to only feed the dog with the left hand.It was to prevent them accepting any food from strangers that might be bad for them,(most people are right handed). I'd rather reinforce my authority over Tuffy with a loud deep voice "no" off"! When Tuffy gets crazy on people. It does work if we do it every time. He just wants everyone to stay forever and play with him. My little darling. Cotons as other dogs go thru stages. 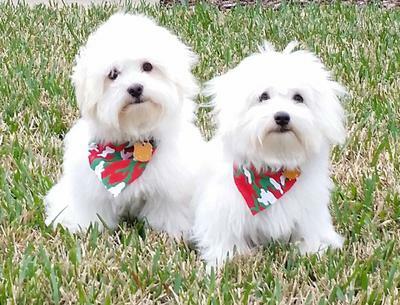 In obedience training their is a lot of socialization work so I am surprised ur Coton has maintained the barking. Here is a suggestion in ur office since they will feel protective. Hang on the door a bag w/squeaky toys & cheerios, dog food or freeze dried liver. Ask if the ppl that enter ur office will help u w/ur pup. When they start to come in have them squeak the toy then toss for ur pup. When the dog turns attention back to them have them toss down ur Coton a treat or 2. They do not need to pet ur pup unless they r comfortable with this. U then can toss ur pup a treat as long as all growling has stopped to say u approve of their behavior. Repetition is the key. As this is continually done ur Coton will learn to see visitors as good things & relax. Also if u can get yourself out to a local dog park. Socialization, socialization, socialization. My 2 y/o Coton had the same problem. I tried the Cesar method... didn't work. I couldn't get her attention at all when she was in that mode. I got Gentle Leader but kept forgetting to put in on so that didn't work. Now I use the water bottle. It startles her enough to break her concentration & focus back on me. It's been 2 weeks & already I'm seeing a big difference. Not perfect yet but I'm sticking with it because it IS working. You might want to contact her breeder. That is the first place you should be going to if there is a problem. Your puppy must be under some kind of guarantee? No? Our Coton has the same up issue; the trainer recommended a high output adjustable spray bottle filled with water. At the first sign of aggression, we strayed on her head - it startled her but didn't scare her. Her aggressive behavior and barking now stop if she sees e bottle or hears e word "bottle"; her protective nature very strong but, once she gets closer, she only wants to play. Good luck! I have the same problem with mine 8months old. When we got him he was afraid of everybody but soon he realized that if he is aggressive nobody will touch him. We also had dog behaviorist visit (actually 2 ) and the diagnose was: fear. Now we try to eliminate this behavior and not allow it. Try to stop it before he starts barking by puling him short and fast to get his brain out of tens mood. And yes, energy is all- mine is also to week for him. Our 8 month old coton is very playful during the day. At night she becomes aggressive and growls. She has even bitten my hand. What is going on? Comments for Daytime vs nighttime behavior. We have a 3 month old that our family of 4 loves and enjoy very much. But after a day of napping whenever he chooses he often has an energy burst just about the time we would like to mellow out on the couch for the last hour or so of the day. He play bites hands,arms,shirts with enough aggression to cause pain and those needle sharp baby teeth easily break the skin. He even play growls but with false aggression. We have a no tug-o-war ban in our house because it takes him a good. Hour to finally mellow out. We put him in his in house fence pen until he calms down. Then he wants to come up on the couch and sleep next to family members until bed time in a big fury cuddly ball. I guess it's the nature of this great breed. (1) He growls when he chews on LEATHER shoes and RAW HIDE bones. He growls on fresh COW BONES - ALL animal products. (2) He is mellow in my bed but has growled on the living room couch. The couch is Italian LEATHER! (3) By covering the couch, by removing leather items and animal bones he doesn't growl. (4) When he gets aggressive (overly assertive) I take him for a car ride to the store or gas station. I take him inside & show him around. People greet him. He becomes intimidated easily with strangers. By the time we get home HE is a quiet, a sweetie again and his playful aggressive biting stops. Seems like he gets too over confident at home so taking him out puts the bigger world into perspective. It sure works! Evening or night? My boy can be pretty wound up/crazy in the evening if he doesn't get enough exercise during the day but when night comes, he crashes. Is your baby would up during the night? My one is also determined to get into bed early. We are almost always in bed by 8 and watch tv the remainder of the night in there. If we have company or for some reason do not----Cotton will get in front of me---growl and run to the bedroom door, if ignored she will come back growl-bark and grab at my hands. (no biting-just my fingers in her mouth). We do not know whether its because she is that tired or we think it may be that is when she gets her dental greenie. She loves them. She has on two occasions even stomped her back right foot on the floor. I have tried and tried to video her doing this but of course she doesn't do it when I want her to. I would not think yours is being aggressive but they sure have their ways of letting us know what they want. Does the behavior change once in the bedroom? Is she not getting as much attention at night when you are busy watching tv or doing something else?............They are very smart and in-tune with our actions and emotions and I think mine reads my mind. I have learned after 4 years with her what she wants me to do---not always why though. Sometimes their signals are very subtle but if we observe and watch them it will become evident what they want. BITING is never acceptable but yours is very young for that.....I did alot of trial and error in training Cotton. It is a learning experience and although I have always owned at least one dog I find cotons a whole different ball game. Good luck with your baby and hope someone will have some answers for you. Are u playing tug of war w/ a toy or a little rougher play? What exactly r u doing that brings on behavior. Playing, laying in bed watching tv. An 8 mo old dog does not really have aggression as a 11/2 yr old. Mayb is the play ruff & since they have sharpteeth could ur pup b thinking of it as play? That's funny - we've noticed the same thing somewhat. What we've figured out is our Coton is not a night owl & likes to go up to bed by 10p or so. She gets sleepy & grouchy the later it gets. She will start going to sleep on the sofa or floor - tired from her day. They are very loyal & super attached to their families. She gets so excited when we tell her it's bedtime & she runs up to our bedroom. Good luck! Cotons are amazing, lovable, loyal, sweet dogs.